-although geez AMC, way to wield the double edged compliment! 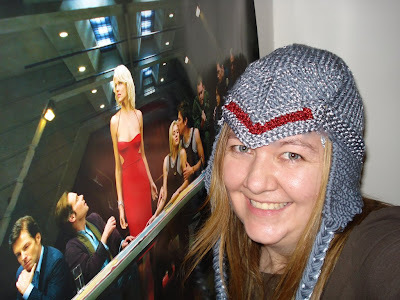 No, my knit hat does not compare to Tricia Helfer, She's Tricia fraking Helfer!! But thanks for using us in the same sentence, and in the same post as RDM news. and Thanks to all the other twitters, live journals and blogs my pattern has popped up on. This is what traffic to my blog looked like this past week. I must say it has been unnerving going to my favorite blogs and seeing my face all over the place, so it's a good thing I can hide behind my latest finished project (finished project 4 of 2009) when I am feeling overly exposed, or exposed to the elements since it has been damned cold here lately. 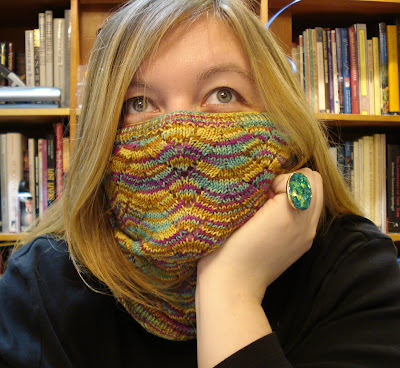 This cowl is based off Cookie A's Monkey sock pattern but knit without purls. The yarn is Socks That Rock I picked up at Rhinebeck. I have to show some blog love to that ring I am wearing. It was my gift to myself from the Bust Craftacular this year. It is ridiculous, sparkly, and huge and I absolutely had to have it. I managed to line up early enough to get a gift bag, and I saw Amy Sedaris. So much fun. 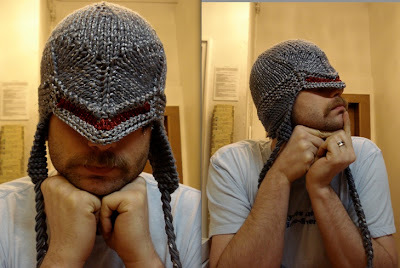 My pal J decided he needed in on the Cylon hat action too, so I got some better pictures of the hat on him if you want to see it in better light and from the side. For some reason my apartment is like the black hole of light and I get much better pictures at work. Just wanted to say Hello! to all the Craft, Ravelry, and Geek Crafts visitors! Updated to include the io9 readers, Omigod.I am freaking out a little bit right now, I LOVE io9. Cylon Centurion Pattern is Up! Hello! 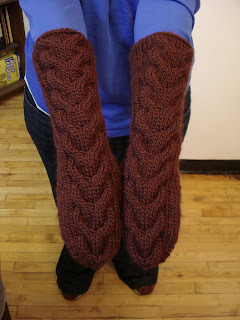 The Updated Pattern has been uploaded to my Ravelry store for free! This one should make much more sense the the original. Thank You for your patience while I rewrote the pattern. In honor of the start of the final season of Battlestar Galactica, I present the geekiest thing I have ever made (or is that the stake I carved in honor of Buffy when I was 16? 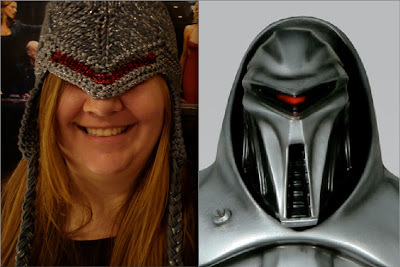 ), the Cylon Centurion hat! I started this about 8 months ago when I was in the early throws of BSG obsession. I hacked together a pattern and frogged it many times so it sat in a bag until this week when I started tackling WIP's. I am new to the pattern making, I don't rely on them very much in my knitting, so if you have any comments or suggestions I am happy to hear them. If you need any help let me know. I have been thinking about posting for months. I have so much to post really, pictures from NY Sheep and Wool, my future house on Chestnut Street in Rhinebeck, Christmas gifts that came out perfect, and pictures of projects I already finished in 09 as part of my resolution to knit from my very large stash of yarn and finish WIP's. 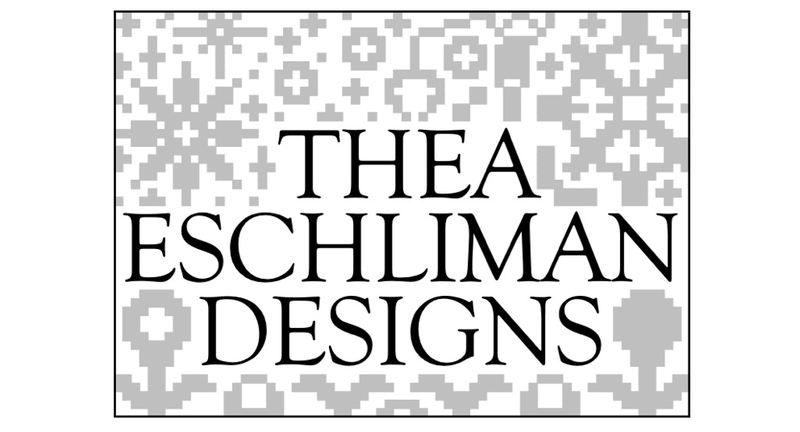 So to break this bad trend of not posting, and throwing order to the wind, I am posting a few projects. But first my resolutions. This year I am going to try desperately to finish knitting projects I have started. I have a horrible habit of cruising the internet at work, getting excited about an awesome project or idea, and then going out immediately after work and getting the supplies for said project. I will go home and start my new project, and it will indeed be awesome. It will be awesome for that night, maybe that weekend, and then it will be awesome in a ziploc bag, in a box, waiting for the day that I have time to finish this great project because I have already moved on to the next thing. The problem is, I don't want to forget the inspiration I had for any given project so I just keep starting them. This year, I will swim against the current and I will finish projects that I have already started. Here are two projects that I have already finished this year, working from yarn in my stash. The pattern is Bella's Mittens. Oddly enough, there seems to be a brown and blue theme. Normally I am all about the pink, but the new year and winter weather is inspiring a new color palette. OK That got me started. I hope to post all of the things I mentioned above and more, let's see it I can use the start of a new year as motivation. This particular post was inspired by Adina, who posted something similar in her blog. I think the resolution to finish projects and knit from stash is an annual and universal one among crafters.